Go for a ride under the moon. PlayerUnknown’s Battlegrounds’ new snow map, Vikendi, has been given some extra attention today. Along with bug fixes and quality of life tweaks, you’ll be able to get your hands on a new weapon, new attachment and the nimble snowbike. Vikendi’s loot balance has also been changed, and you can see how that will affect weapon spawns in this developer letter. The flashiest new addition to PUBG’s chilly map is the snowbike. If you want to run circles around snowmobiles, this is your best bet. It’s quick, has better mobility, but this comes at a cost: it’s very easy to blow up. It replaces the motorcycle, which will no longer spawn on Vikendi. And what better time to take your new bike for a spin than the dead of night. 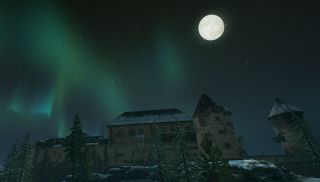 Vikendi’s new weather setting lets players duke it out underneath a shining moon and the striking aurora borealis, which should make everyone a bit easier to spot. And shoot. Why not use the new SMG to light up the night even more? The Bizon is an exclusive 9mm SMG for Vikendi and Erangel. It’s joined by a new weapon attachment, the canted sight, which is designed for weapons with a secondary scope slot, including the Bizon. The full list of weapons you can use it for are below. Performance has also been optimised by reducing the number of footprints shown around the player. There are some minor UI and UX changes, too, as well as a new BattleStat weapon skin that records the number of players killed. The full list of bug fixes can be read here. The update is currently available on the test server.